StP14 Ouistreham (Sole), K.V.U.Gr Riva-Bella, K.V.Gr Caen. 1 x R634 six embrasured turret. 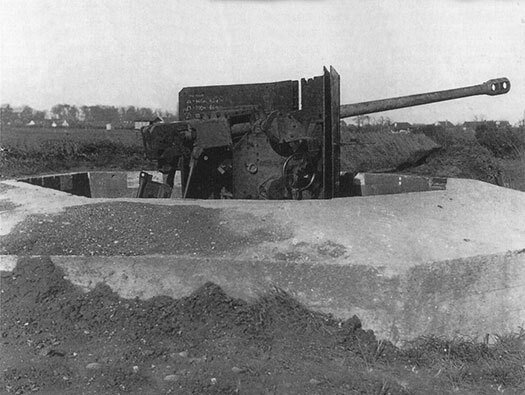 1 x R667 Small 5cm KwK casemate (planned or under construction to replace the Nr1694). 1 x Nr1694 ringstand for a 5cm KwK gun. 1 x Vf69 Heavy mortar position. 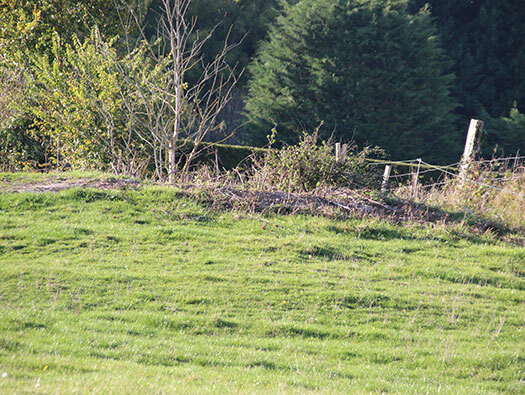 7 x Unterstands (small field bunkers not reinforced). 2 x Feldmässig a concrete none standard bunker/shelter..
1 x 5cm KwK 5cm Pak L/60. StP14 Ouistreham R634 six embrasured turret. 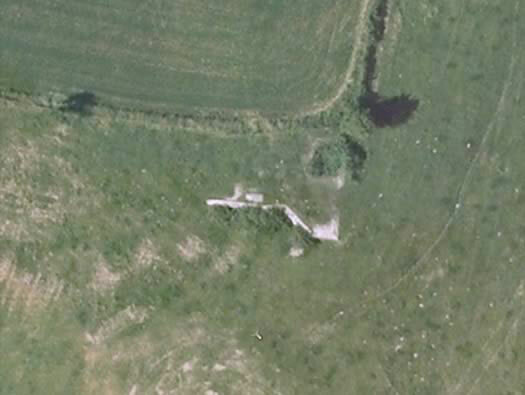 R634 is still in place a six embrasure steel turret bunker. A steel dome set into the concrete with six openings to allow a fortress mounted machine gun to be moved to any of the openings (embrasures). Each embrasure has a closing so that when not in use it can swing and lock closed to stop the ingress of an bullets/shrapnel. StP14 Ouistreham Stab I./Grenadier-Regiment 736. 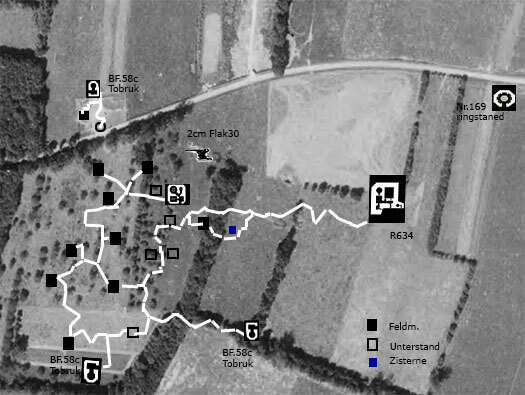 Plan of the HQ - Stab I./Grenadier-Regiment 736. 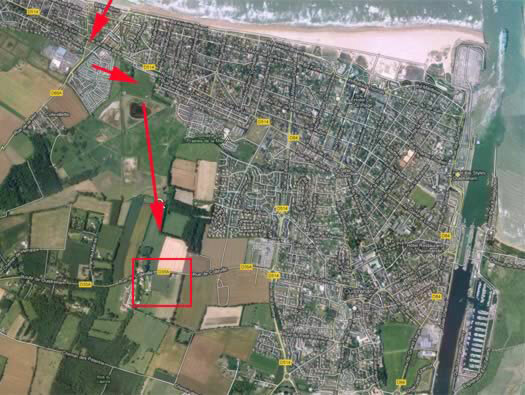 This is where the HQ would control the Wn's and StP's along the coast and fight the battle as it progressed. 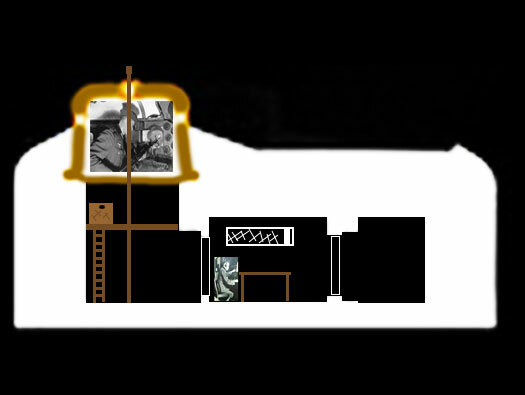 They would have had a telephone net with wires in armoured sheaths snaking out to all the defence posts and to the main HQ behind. Also a radio room to use is the land lines went down. Wehrmacht Feldernsprecher FF33 1935 original Feldtelefon Bakelite. It can just be seen from the air. I walked up between these trees and you can just see the bunker on the right.. The first arrows is where I walked. The second the photos. StP14 Ouistreham R634 six embrasured turret plan. The R634 close up of the entrance. 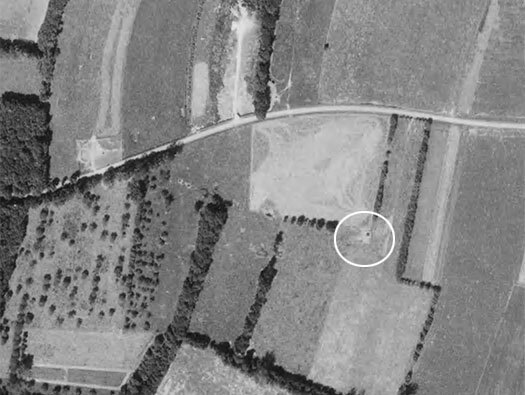 The R634 close up of where the turret would have been. 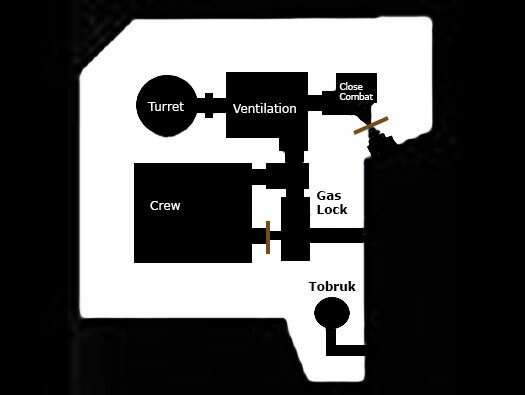 Plan of an R634 with a large crew room, gas lock entrance, a ventilation room, a fighting turret and a close combat defence room to cover the rear door. 40P8 turret would have been used here. Lowering a turret into place. Ventilation gas filters. The hand pump would be turned and fresh air sucked in through pipes into the bunker, filtered through charcoal filters. The doors would be sealed and an over pressure inside meant gas could not enter. StP14 Ouistreham R634 six embrasured turret elevation. StP14 Ouistreham Nr1694 ringstand for a 5cm KwK L/60. The only real heavy gun protecting this HQ was a 5cm KwK L/60 with its muzzle break. Bigot plan of the defences. The German artillery fire plan for the beach areas defended by Stab I./Grenadier-Regiment 736. StP14 Ouistreham 2nd E Yorks. The route taken by the 2nd E Yorks. Supported b y the 76th Field Regt. RA. 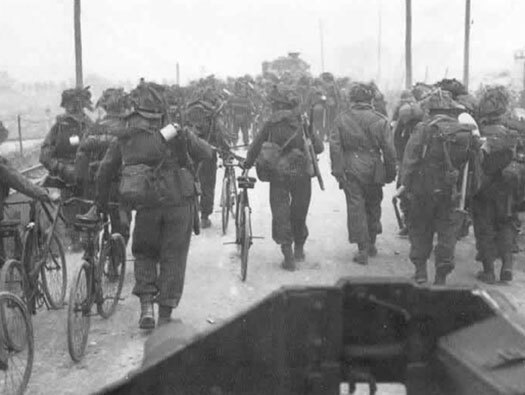 The 2nd E Yorks landed on D-Day morning around 7.20am and advanced into very heavy machine gun fire. Many were killed and wounded. 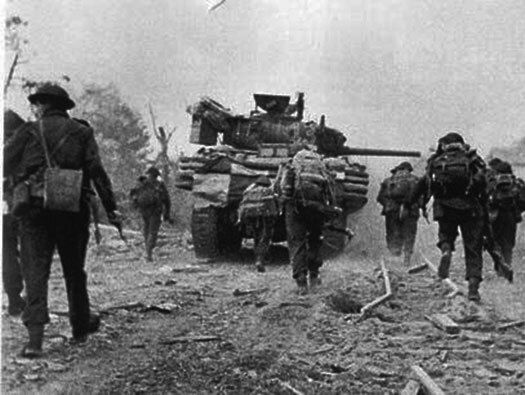 They managed by advancing as fast as they could to overwhelm the enemy and with the help of tanks that should have landed first but due to circumstances could not. After clearing the beach the 2nd E York move to the left as the inland was flooded then advanced across country. Again tanks had not been able to keep up, their FOO officer (Forward Observation Officer) was killed and so they had no naval support. Luckily the 76th Field Regt. RA had managed to get some self propelled guns ashore and supported the Yorks. 76th Field Regt. RA Sextant 25pndr artillery. 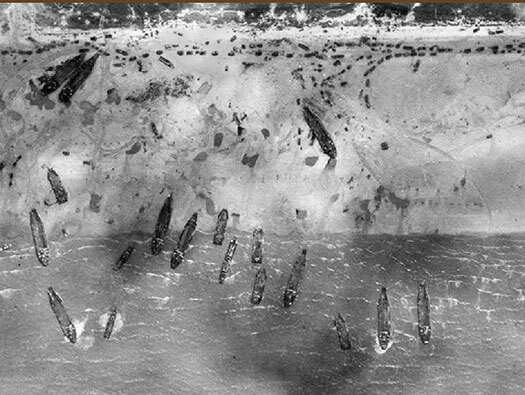 DD Sherman tanks coming ashore. Sword Beach Queen Red sector where the 2nd E Yorks landed. 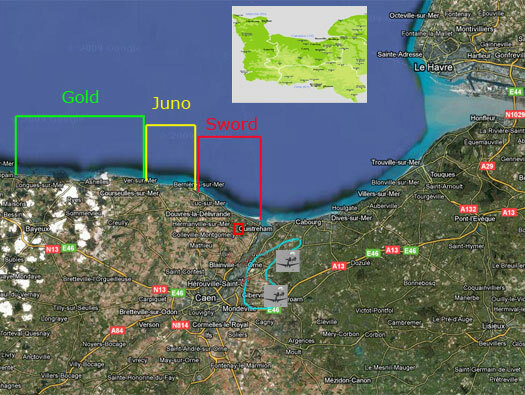 Plan of Sword Beach red sector. Infantry following a DD Sherman. 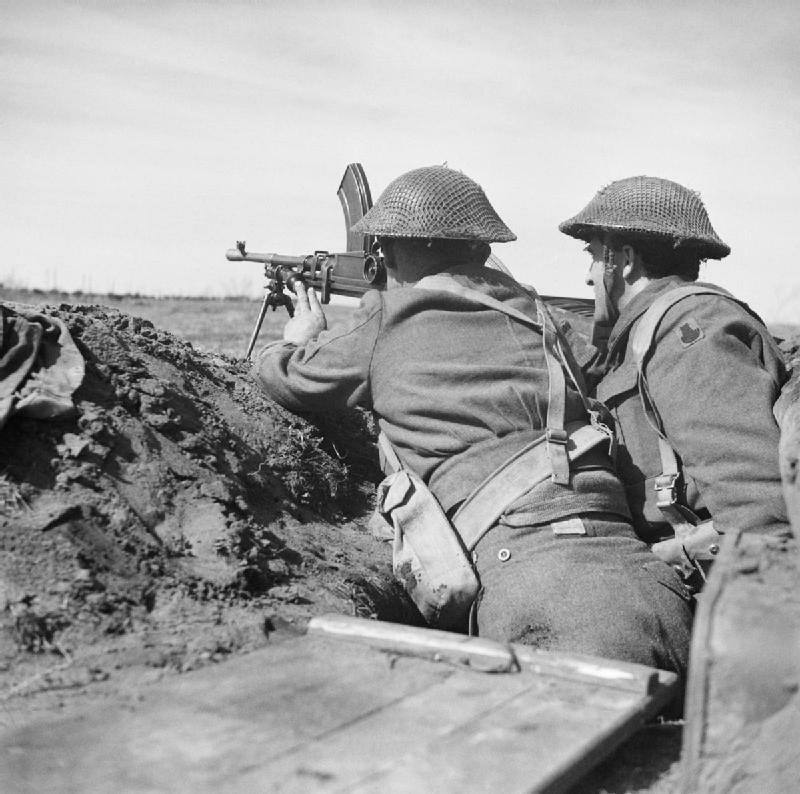 The 2nd E Yorks advanced towards StP14 and came under heavy machine gun fire. There was a Tobruk on the forward left flak with a machine gun and also the turret of the R634 had a machine gun covering the forward area. There was also the 5cm KwK and a 2cm Flak 30 but these may have been disabled by the artillery fire. 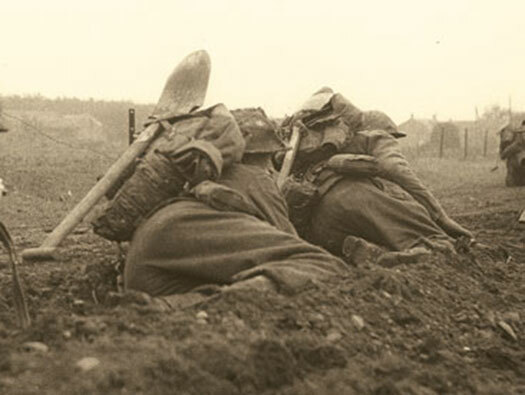 A set piece attack was ordered, something they would have practised in England and with the support of the 76th Field Regt. RA Sextant 25pndr artillery the HQ was taken..
Mf09 minefield almost surrounded the position.